Tragically, as we observed in a recent posting, many of the soldiers of the 2nd Battalion of the Norfolk regiment who served in Mesopotamia now rest in modern-day Iraq. As the calamity of Kut al Amara unfolds that number will increase dramatically. But the 2nd Battalion were not alone in the Norfolk Regiment in serving in the war against the Ottoman Empire; the territorial and yeomanry battalions, too, saw action in Gallipoli, Palestine and Salonika (which had been restored to Greece from Ottoman control only in 1912 during the First Balkan War). Those soldiers who returned to Norfolk would have brought home souvenirs of their service overseas, and hidden away, perhaps unrecognized and unregarded, there might be the coins, the change, that they picked up in Ottoman lands. It can be no surprise that these small treasures are sometimes found particularly by families in Australia and New Zealand, brought home by returning ANZACs, many of whom, like their British compatriots, were in transit through Cairo and later were reassembled in Egypt following the evacuation of Gallipoli. At that time, Egypt was still nominally part of the Ottoman Empire, although in 1867 the Sultan had acknowledged a local viceroy, known as the Khedive, governing in the Sultan’s name, while after 1882 effective management of the country lay with the British. Ottoman coins fall roughly into two kinds: those minted in Constantinople for circulation throughout the empire, and those minted in semi-autonomous Egypt, which also circulated widely. they have a tughra on the obverse side of the coin instead of the Sultan’s profile. 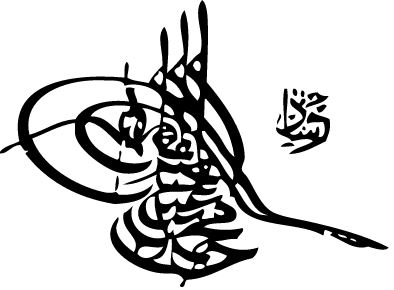 A tughra is the monogram of a sultan designed in fine calligraphy. It has a special meaning for each sultan (see http://en.wikipedia.org/wiki/Tughra). the sultan in Constantinople at the time of minting. The dates on Ottoman coins were shown according to the Islamic calendar in years AH, that is ‘Year of the Hejira’ (anno hegirae) or the year when the Prophet Mohammed fled from Mecca to Medina, which we take to be AD 622 in the Christian calendar, or CE 622 as it is sometimes now written. The coin below is a cupro-nickel coin, 28 mm in diameter: the tughra is of Sultan Abdülhamid II, and the date can be calculated using the numbers shown circled in red on the reverse of the coin and in yellow on the obverse. Entering a date of 1/1/1325 and converting from Islamic to Christian gives a date in 1907, which is the year of this coin, and which would certainly have been in circulation when troops from Norfolk were in the Near and Middle East. This 1 qirsh (kuruş) coin was minted in Egypt. The design of Egyptian coins of this date includes the denomination mark on the obverse below the tughra, with the regnal and accession years on the reverse. In this case the mint mark for Misir, the Turkish name for Egypt, is also shown on the reverse. It was minted in 1914/15. NB ش in Arabic script means qirsh or kuruş. This is a tiny Egyptian 1 para or 1/40th qirsh coin – the lowest denomination of the time, about the size of a modern British 5 pence piece but in copper. It would have been in the change of every soldier shopping in Cairo. In this case the regnal year is on the obverse, and the accession year on the reverse. The mint date shouldn’t be difficult to calculate. Coins do not have the personal intimacy of letters and medals, but they can be a link with times past and places to us unknown but which were familiar and important in the lives of the men who served in distant lands. This entry was posted in research project and tagged Coins, Mesopotamia, Ottoman Empire, The Norfolk Regiment. Bookmark the permalink.